FPHC Director Darrin Rodgers with Rev. Elijah L. Hill, displaying the collection. An important collection of almost 500 historic photographs relating to the Church of God in Christ is now accessible for free on the Flower Pentecostal Heritage Center website. The photographs (circa 1899-1960s), from the Mother Lizzie Robinson / Rev. Elijah L. Hill Collection, portray men and women who pioneered the African-American Pentecostal denomination. The photographs were collected by Mother Lizzie Robinson (1860-1945) and her daughter, Ida F. Baker. Robinson organized the Church of God in Christ (COGIC) Women’s Department in 1911 and was the most prominent female COGIC leader until her death. As head of women’s auxiliaries, she founded the Prayer and Bible Band and the Sewing Circle. She also helped to lay the foundation for the creation of the Missions Department (originally known as the Home and Foreign Missions Band). Elijah L. Hill, the COGIC minister and historian who deposited Robinson’s personal papers at the Flower Pentecostal Heritage Center (FPHC), described the photographs as “a rare glimpse into the faces of those who suffered and yet overcame the world.” In his biography of Robinson, Women Come Alive, Hill detailed how Robinson encouraged COGIC women to become self-determining, before the broader society recognized women’s suffrage and civil rights for African-Americans. The Mother Lizzie Robinson / Rev. Elijah L. Hill Collection consists of, in addition to the photographs, approximately 100 publications and Hill’s research files on Robinson. The collection was dedicated in a special service on October 4, 2013, in the William J. Seymour Chapel at the Assemblies of God Theological Seminary in Springfield, Missouri. The online collection will be unveiled at the biennial General Council of the Assemblies of God, slated for August 2-8, 2015, in Orlando, Florida. Elijah L. Hill will join Darrin Rodgers at the Flower Pentecostal Heritage Center booth at General Council, where they will interact with expected crowds in excess of 20,000 people. Click here to view thumbnail images of the photographs. Click on the title next to each thumbnail image to see larger images. Click here to watch the dedication service of the Mother Lizzie Robinson / Rev. Elijah L. Hill Collection. Click here to watch a panel discussion featuring Elijah Hill, COGIC historian Glenda Goodson, Darrin Rodgers, and Assemblies of God missions historian Barbara Cavaness Parks. Panelists dialogued about Robinson and the legacy of women in the COGIC and the Assemblies of God. Rev. Elijah L. Hill is assembling biographies of Church of God in Christ leaders pictured in the photographs. To submit biographies, go to Hill’s website: www.cogicmuseum.org. The Flower Pentecostal Heritage Center, located in the Assemblies of God National Office in Springfield, Missouri, is the largest Pentecostal archive and research center in the world. The FPHC collects historically significant materials from across the denominational, ethnic, linguistic, and national divides within the broader Pentecostal and charismatic movements. For additional information, explore the Flower Pentecostal Heritage Center website. 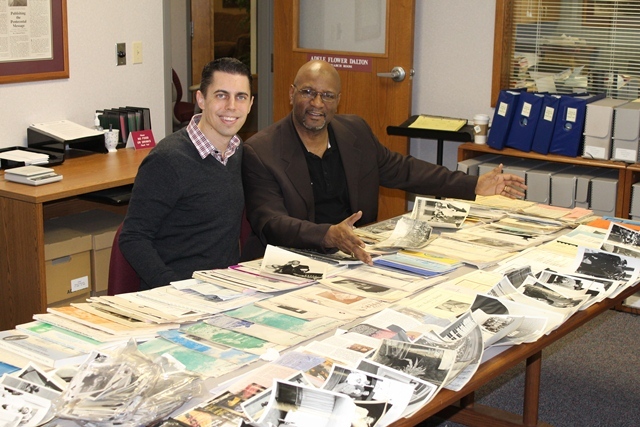 Do you have Pentecostal historical materials that should be preserved? Please consider depositing these materials at the Flower Pentecostal Heritage Center. We would like to preserve and make your treasures accessible to those who write the history books. The personal papers of Mother Lizzie Robinson, an important church leader in the early decades of the Church of God in Christ (COGIC), have been deposited at the Flower Pentecostal Heritage Center (FPHC). The COGIC, a historic African-American church, is the largest Pentecostal denomination in the United States. The collection was dedicated in a special service on October 4 in the William Seymour Chapel at the Assemblies of God Theological Seminary. Scholars, church leaders, and students from across the denominational and racial divides filled the chapel to honor the life of Mother Lizzie Robinson and the legacy of women in the COGIC. Mother Lizzie Robinson (1860-1945) organized the COGIC Women’s Department in 1911 and was the most prominent female COGIC leader until her death. As head of women’s auxiliaries, she founded the Prayer and Bible Band and the Sewing Circle. She also helped to lay the foundation for the creation of the Missions Department (originally known as the Home and Foreign Missions Band). Elijah Hill, the COGIC minister and historian who deposited Robinson’s personal papers at the FPHC, delivered the keynote address. He noted that Robinson lost her position as matron of Arkansas Baptist College after she was baptized in the Holy Spirit at age 46. COGIC founder Charles H. Mason then asked her to organize women in the COGIC. Hill explained how Robinson encouraged COGIC women to become self-determining, before the broader society recognized women’s suffrage and civil rights for African-Americans. Glenda Goodson, a COGIC historian who also spoke at the dedication, provided an overview of the history of women in ministry in the COGIC. In one memorable story, she related how COGIC women desegregated the hotels in Albany, New York, in 1964. Goodson emphasized the powerful role of women in promoting the Holiness and Pentecostal message. The Mother Lizzie Robinson / Rev. Elijah L. Hill Collection includes the papers of Robinson and her daughter Ida F. Baker, as well as other publications collected by Hill. The collection includes approximately 500 original photographs (circa 1899-1960s), approximately 100 publications, and Hill’s research files on Robinson. A panel discussion featuring Elijah Hill, Glenda Goodson, FPHC director Darrin Rodgers, and Assemblies of God missions historian Barbara Cavaness Parks was also filmed. Panelists dialogued about Robinson and the legacy of women in the COGIC and the Assemblies of God. Watch the dedication service of the Mother Lizzie Robinson / Rev. Elijah L. Hill Collection. The Flower Pentecostal Heritage Center (FPHC) is delighted to announce the dedication of a significant collection of Church of God in Christ (COGIC) historical materials. The Mother Lizzie Robinson / Rev. Elijah L. Hill Collection will be dedicated on Friday, October 4, at 2 p.m. in the William Seymour Chapel at the Assemblies of God Theological Seminary. Mother Lizzie Robinson (1860-1945), the organizer of the COGIC Women’s Department, served alongside Bishop Charles H. Mason in an important role in the formational decades of the COGIC. As head of women’s auxiliaries, she founded the Prayer and Bible Band and the Sewing Circle. She also helped to lay the foundation for the creation of the Missions Department (originally known as the Home and Foreign Missions Band). Elijah Hill, a COGIC minister and historian, deposited Robinson’s personal papers at the FPHC. The public is welcome to attend the dedication service. The service will honor Lizzie Robinson and highlight the legacy of women in the COGIC. Elijah Hill, who has authored seven books, including a biography of Robinson, will speak on Mother Robinson’s life and legacy. Glenda Goodson, who has authored a history of pioneer women COGIC missionaries, will also participate in the program, providing an overview of the history of women in ministry in the COGIC. FPHC Director Darrin Rodgers will emcee the program and AGTS President Byron Klaus will deliver the dedicatory prayer. Dr. David Knox and Minister Quinci Williams of Deliverance Temple will lead worship with an introduction to Church of God in Christ hymnody. Zollie Smith, Executive Director Assemblies of God U.S. Missions, and representatives from Timmons Temple Church of God in Christ will also participate. A panel discussion featuring Elijah Hill, Glenda Goodson, Darrin Rodgers, and Assemblies of God missions historian Barbara Cavaness Parks is also scheduled to be filmed. The Flower Pentecostal Heritage Center, located in Springfield, Missouri, is the largest Pentecostal archive and research center in the world. The Center collects historically significant materials from across the denominational, ethnic, linguistic, and national divides within the broader Pentecostal and charismatic movements. For additional information about the dedication, contact the Flower Pentecostal Heritage Center by email (archives@ag.org) or toll free by telephone (877-840-5200).